CUAT Conference, January 2018 – Our Trainers’ turn to be trained! 5th February 2018 - CUAT Conference, January 2018 – Our Trainers’ turn to be trained! 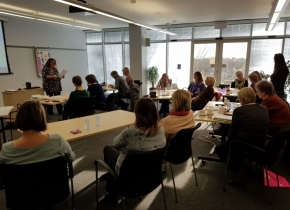 At the end of January, it was once again the turn of the Catch Up Accredited Trainers (CUATs) to take part in their own training and update at our CUAT conference! These conferences are organised twice a year for the trainers – this one taking place at the Catch Up® base in Thetford. The average response to the question, ‘How helpful has the conference been to you?’ was 5 (with 1 being ‘least helpful’ and 5 being ‘most helpful’)! Catch Up® CEO, Theresa Rogers, hosted the conference with the rest of the team, with the aim of ensuring that all of the Accredited Trainers were fully updated with the exciting tools, resources and training packages available from Catch Up®! It also provided an excellent opportunity for the trainers to feed back on their experiences in the training rooms, and offer some fantastic suggestions for possible next steps. celebrating the amazing success of Catch Up® during 2017 – over 2,000 more people trained to deliver the interventions. This brings our total number of people trained to over 28,000! hearing that the average trainee response during 2017 to ‘How would you rate the training course overall?’ was 4.6 (with 1 being ‘poor’ and 5 being ‘excellent’)! learning that the additional courses have also been extremely well received, and have shown us that an excellent job is going on in settings delivering Catch Up® far and wide! These courses have included our very useful Review and Refresh sessions. hearing that the number of people successfully submitting for the Catch Up® qualifications has continued to grow! We also said a very sad farewell to two of our Accredited Trainers, who have now officially retired. Megan and Carys have been part of the Catch Up® family for many years, and have both gone above and beyond to ensure that trainees have left the training rooms feeling inspired and motivated to make a difference. We will miss them both greatly, but wish them all the best for the future.